Klaus Lutz‘s work is brimming with infectious urgency. Before his death in 1993, the Swiss artist spent 16 years in New York, developing an indecipherable alphabet based on ancient symbols and making fantastical space travel-inspired films from his studio flat in the Lower East Side. Little known in his time, the Zurich-based Rotwand gallery has been working to revive Lutz’s vision and work with a recent retrospective at Museum Haus Konstruktiv and their first appearance at the Armory Show this year. Showing a selective collection, Rotwand has captured the spirit of Lutz’s passion to share a message he spent shaping at home. “He was convinced that our language and grammar was not enough,” said one gallery representative. 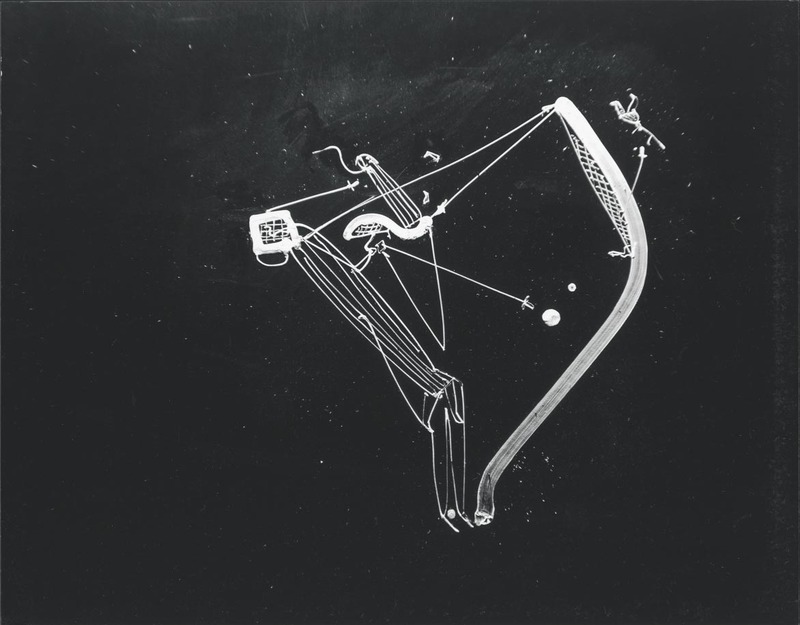 Always beginning with drawing, Lutz’s work illustrates his obsession with complete process. Beautiful compositions of stark white chalk lines and shapes on black plastic tamper with the viewer’s grasp of texture and material and whose starkness is similar to Man Ray‘s monochrome images, like pale silhouettes of measuring instruments or mathematical scrawls. Lutz would photograph each drawing and then wipe the plastic clean to start anew. When this became too costly, he took to filming each picture. On one fortuitous occasion, he left the film running and inadvertently began an ongoing fascination with developing films of himself making marks and moving objects. 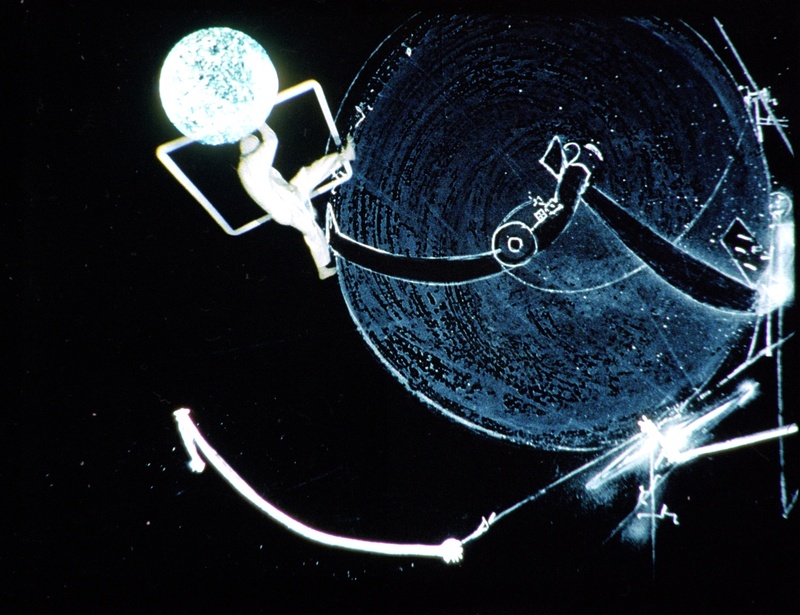 The two films – Caveman Lecture, 2002 and Vulcan, 2004, are screened onto a white balloon to emphasise his pursuit to break borders. The clickety-click 16mm quality makes them feel dated, though they were only made in 2004. 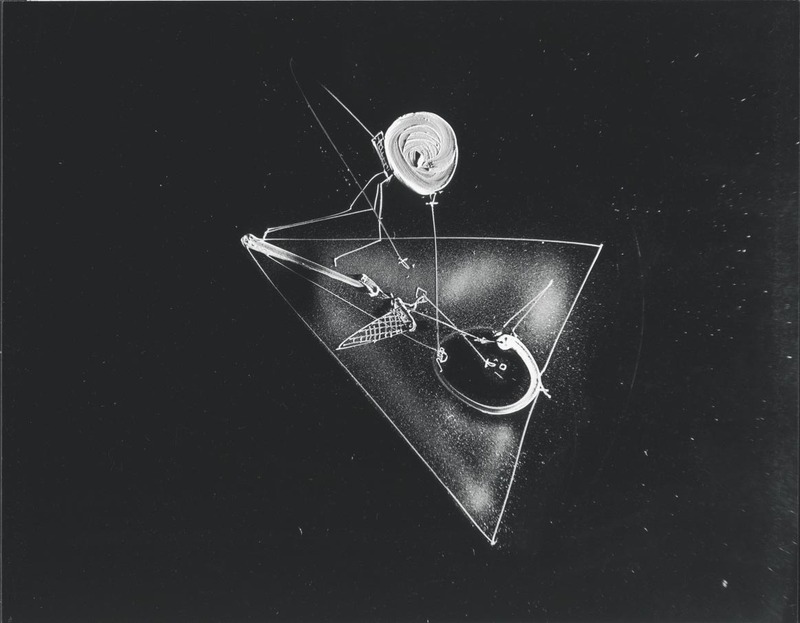 Gazing on, one silver-haired onlooker said quietly: “I miss that sound.” The films are layers of different reels, showing himself in red, black, grey or white jump-suits – an apt uniform for a man engineering his own virtual space travel – climbing the star systems, spinning and maneuvering large, abstract wheel sculptures. It is a mystery, but one that is reminiscent of the adventure of early cinema and the possibility film affords a ground-anchored citizen. In contrast, the other drawings on show are more formal – instructive story boards for the films and symbols lined up as stick men. The gallery representative shows me a precious piece in their collection, an ‘accordian file’. She has gloves on to handle it and the care that goes into unfolding the thin strip and its explanation is testament to the treasure that she holds. It is a strip of thick, textured paper with a sequence of drawings, small and intricate of shapes, scenes, kinetic stills. It is like a scroll, a clash of comic-strip story-telling embedded with a coded, ancient wisdom. Though they are keen to share his work, Rotwand is acting as archaeologist and code breaker, as much as guardian of Lutz’s legacy. 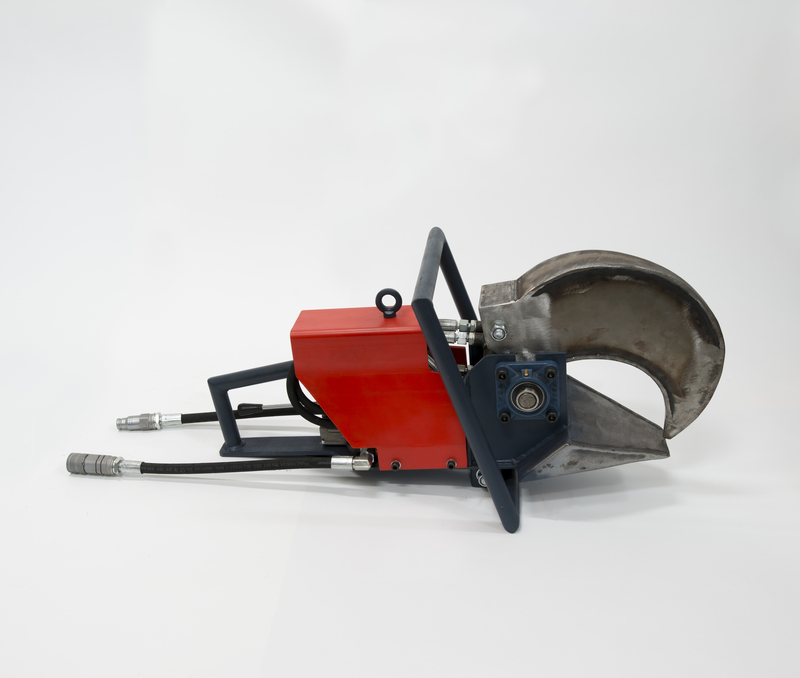 James Capper’s Ripper Teeth series, Hydraulic Power Tools for New York, is a curious thing to behold. Inanimate, sitting heavily on pale plaster cubes, they promise a raw and dirty act. Their industrial form and uncannily shaped blades, grinders, diggers and some other tool heads that evade description, are made more intriguing by the lack of power that they so desperately cry to surge through them. Their cables hang impotent and waiting. When I tell one gallery representative that I think they look aggressive and medieval, he points out that they also share a likeness with natural imagery: bird beaks, bunched fruit and, if you look hard enough, some primordial skeletal silhouettes become apparent. Though functional as cutting and shaping tools, displayed like this they are also nostalgic art pieces. Capper’s work is part of an ongoing investigation into land-marking and mark-making that recently cumulated in a installation performance at the Yorkshire Sculpture Park. Here he maneuvered a clumsy cabin to crab-walk on its hydraulic, raft-like feet, stamping textured indents into the earth. 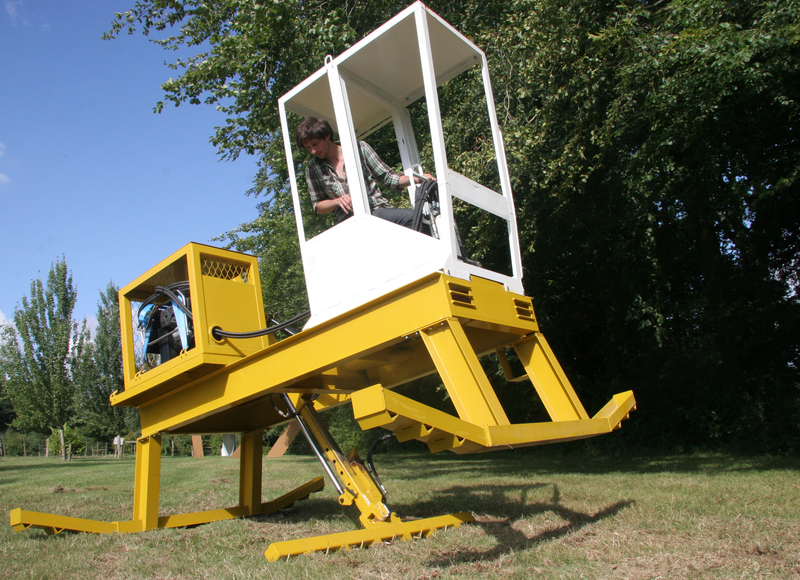 By developing carnivorous, mark-making machinery, Capper joins a line of land artists, but unlike Michael Heizer, Robert Smithson and Doris Salcedo, he builds the tool to cut the land and affect the change. His focus is on the maker maker as much as the mark itself. Capper’s use of a farm machinery aesthetic harks back to Britain’s traditional relationship with the land and an industry that, despite waning to near-depletion, still symbolizes a formative topography and productive history. Though there is a generator in the corner of Hannah Barry Gallery‘s stand, where the ‘teeth’ are being shown at this year’s Armory Show, for the majority of the time (the show runs from the 7th to the 10th of March) they will remain as latent mechanical objects. Farming equipment gone awry.